This sweet and sour shrimp proves that the slow cooker is not just for long-cooked roasts and stews. It's a versatile appliance that offers the convenience of hands-free cooking. 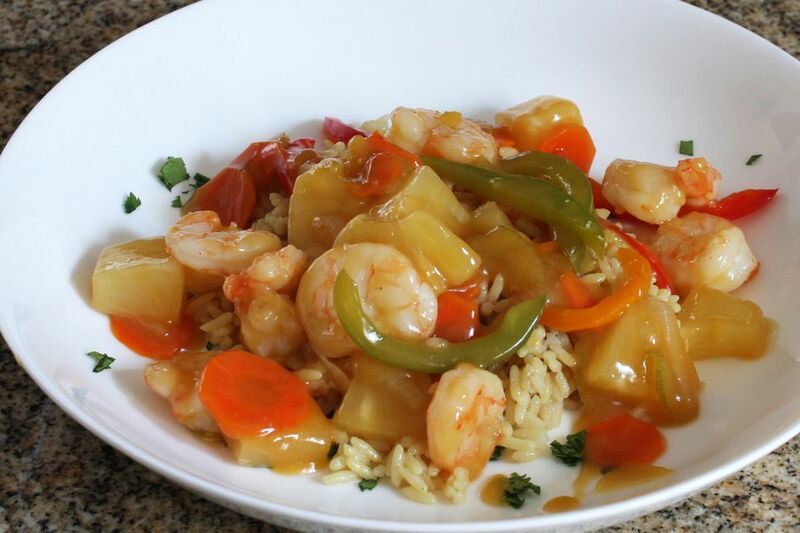 This dish is an easy sweet and sour shrimp, made with frozen cooked shrimp, pineapple, pea pods, and sweet and sour sauce mixture. The shrimp is added to the slow cooker about 15 to 20 minutes before the dish is ready. Pepper strips and thinly sliced carrots or celery would also be great for this dish, in place of or along with the pea pods. Or use a frozen Asian vegetable medley along with the pea pods. Put the pea pods in a colander and run cold water over them until thawed enough to separate easily. Drain the can of pineapple in a sieve over a bowl; reserve 1/2 cup of the juice. Place the pea pods and drained pineapple in the slow cooker. In a small saucepan, combine the cornstarch and sugar; stir to blend. Add the chicken stock, the 1/2 cup of reserved pineapple juice, soy sauce, and ginger. Bring the mixture to a boil over high heat. Cook the sauce for about 1 minute, stirring constantly. The sauce should be thickened and clear. Pour the sauce over the pea pods and pineapple; stir gently to blend the ingredients. Cover and cook on low for 3 to 4 hours. Add the thawed cooked shrimp and continue to cook for 15 to 20 minutes longer, or until hot. Add the vinegar and stir gently. There are a few ways to thaw frozen shrimp. Thaw the bag of shrimp in the refrigerator overnight if possible. For faster thawing, put the shrimp in a colander. Run cold water over the shrimp or submerge the colander in a bowl of cold water for about 10 minutes. Lift the colander out and let the shrimp drain. Pat them dry with paper towels, if desired. For Raw Unpeeled Shrimp: Thaw the shrimp if frozen (see above). Peel a shrimp and run the tip of a small, sharp knife down the back. Pull out the dark vein or scrape it out with the knife. Repeat with the remaining shrimp and rinse them thoroughly with cold water. Bring a pot of water to a boil. Add the cleaned shrimp and reduce the heat to low. Simmer for about 2 to 3 minutes, or until they are opaque and pink in color.